The holiday season is upon us, and it’s time to get prepared for gift-giving! It can be tricky to come up with charming, thoughtful holiday messages for loved ones–especially when there are many people on your list! We’ve helped you out with this list of sweet messages that are perfect for the festive season. Season’s Greetings, my dear friend! I hope you have a wonderful holiday season and a prosperous year to come. Season’s Greetings to you! Wishing you quality time with loved ones and plenty of relaxation over the holidays. Season’s Greetings, my love! I’m thankful to have you in my life and to spend the holidays by your side. Season’s Greetings! May your holiday season be one of joy, love, and warmth. Season’s Greetings, my friend! Wishing you nothing but happiness and the company of loved ones this holiday season. It’s the time of year again to say: Season’s Greetings! As the snow falls and days become short, I hope you enjoy this festive season with family and friends. See you in the New Year! ‘Tis the season for glittering trees, delicious sweet treats, and wonderful company. Season’s Greetings to you, and a Happy New Year! Season’s Greetings, my dear friend! May the holiday season bring you love and joy. Here’s to a prosperous year to come! Season’s Greetings! Snow is falling, lights are twinkling everywhere, and people are giving gifts at every turn. Let’s enjoy this beautiful time of year! Happy Holidays to my favorite coworker! Wishing you wonderful festivities and a wonderful season. Happy Holidays! I’m so lucky to have fantastic coworkers like you. Enjoy the festive season! Happy Holidays, coworker! Have a holiday season filled with friends, family, laughter, and plenty of delicious treats! Happy Holidays to my favorite coworker! 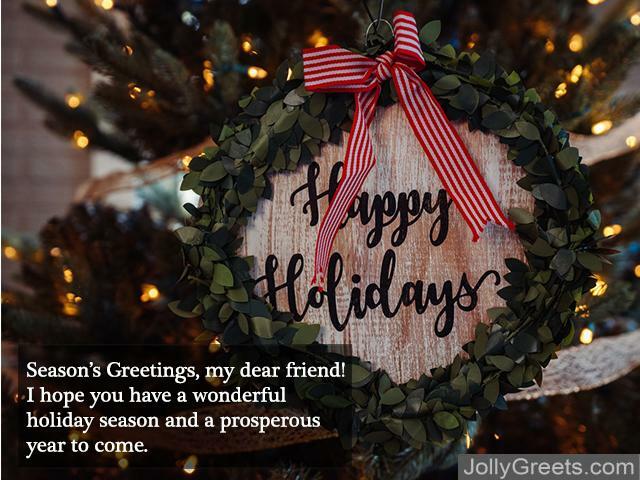 This holiday season, I hope you enjoy time with loved ones and make the most of these festivities–it only comes around once a year, after all! Wishing a very happy holidays to you, coworker! May this festive season bring you joy and a much-needed rest from the office. See you in the New Year! Happy holidays, coworker! May you enjoy the festivities this winter and start the New Year off right. 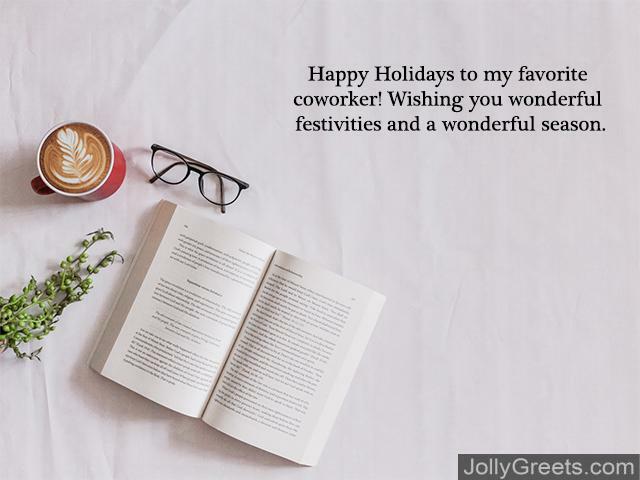 Wishing you, coworker, a very happy holidays! May you spend time with loved ones, eat tasty treats, and make the most of this well-deserved time off. ‘Tis the season to take a break from work and enjoy the holidays! Wishing you happy holidays and a fabulous New Year! Happy Holidays, my dear friend! Another year of our friendship has come to a close, and I couldn’t be more excited for to make more memories with you in the New Year. Enjoy the festivities! 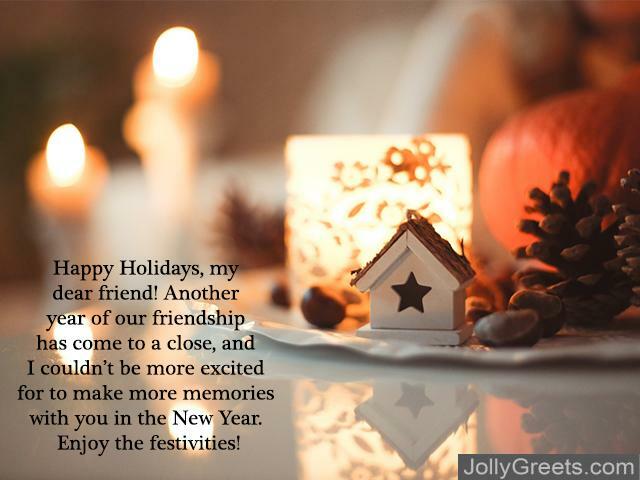 Wishing a very happy holidays to my dearest friend! May you be filled with joy and love during this festive season. Here’s to another year of joy and friendship! Cheers to you, my friend, and happy holidays! Wishing you a wonderful festive season and a joyful New Year! Holidays are always better with friends! I hope you enjoy this joyful winter season and make the most of time with loved ones. Here’s to an even better year ahead! Happy holidays to one of my dearest friends! I feel so lucky to have you in my life. Wishing you a fabulous festive season, and a happy New Year! Wishing the happiest of holidays to my close friend! May you enjoy this season of gift-giving, delicious treats, and spending time with loved ones. See you in the New Year! Happy holidays to my wonderful friend! Between the twinkling lights, the candy canes, and the many, many gifts, your friendship means the most to me. Here’s to a fabulous year to come! Wishing you a very happy holidays and a fantastic New Year! May you prosper in the year to come and enjoy the company of those around you. It’s that time of year again to send you warm holiday wishes! I hope you enjoy the wintery festivities and start the New Year off with a bang. Happy holidays, my friend, and sending you warm wishes for the New Year! This festive season is one of love and happiness, and wish you nothing but the best! A New Year is once again upon us! Sending you my best wishes and nothing but happiness for the year to come. Happy New Year, my love! These winter months may be chilly, but you always manage to warm my heart. The holiday season is better with company, and you are as good as it gets. The weather outside is certainly frightful, but I’m wishing you a delightful holiday season! May the New Year bring you love, happiness, and success! Happy Holidays, my friend, and have a fantastic New Year! Let’s cheers to new beginnings and prosperity in the year to come! The holidays are a beautiful, joyful time of the year. Spread the love and celebrate these special weeks by sharing holiday wishes with those you care about! The happy holidays wishes above are sure to make your friends, loved ones, and family smile. So, let’s deck the halls, bake cookies, hang the mistletoe, and get ready for the holiday season!